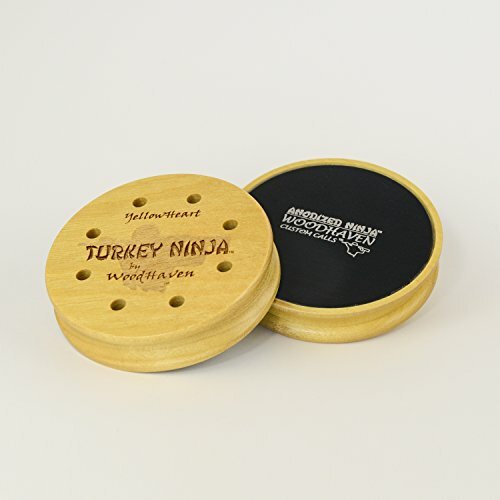 My number one goal as a call maker is design and build turkey calls that help our WoodHaven customers kill more turkeys! That's the bottom line! To do this I continually try and push the limits of our capabilities and never settle for that's good enough. Realism, Realism, Realism.....this is the key in every call we design. The all new "Anodized Ninja" pot call has all the great attributes of a great friction call our customers have come to expect from WoodHaven. The "Anodized Ninja" is built with a yellowheart pot with a treated black anodized aluminum surface which is extremely user friendly. This "Anodized Ninja" is designed to call both soft and loud and has the ability to get extremely loud. The "Anodized Ninja" has the ability to produce high-pitched yelps and cutts to really reach out and cover a lot of ground when calling. The "Anodized Ninja" comes with the all new yellowheart "Ninja Stick" striker as well as our hickory striker. The all new "Anodized Ninja" is a killer call! If you're looking for a new pot call, check out the "Anodized Ninja" and you will soon realize why we're so excited about this new call. It is Realism UnLeashed! If you have any questions about this product by WOODHAVEN CUSTOM CALLS, contact us by completing and submitting the form below. If you are looking for a specif part number, please include it with your message.